A richly illustrated view into the world of New Zealand’s lost birds. In New Zealand’s lush rainforests, isolated from the outside world for 80 million years, many extraordinary birds evolved. They included the giant moa, the beautiful huia, and the largest eagle the earth has ever seen. Within a few hundred years, human settlement extinguished 58 species – over a quarter of the species. For the first time ever, this book brings all these lost birds to life. In rich colour, celebrated painter Paul Martinson depicts each bird in its original habitat. 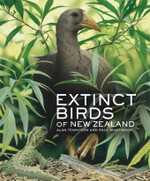 Te Papa palaeontologist Alan Tennyson provides detailed information on the birds as well as a compelling overview of their tragic extinction. This book is essential reading for experts, students, and anyone interested in this country’s natural history. This catalogue is out of print.